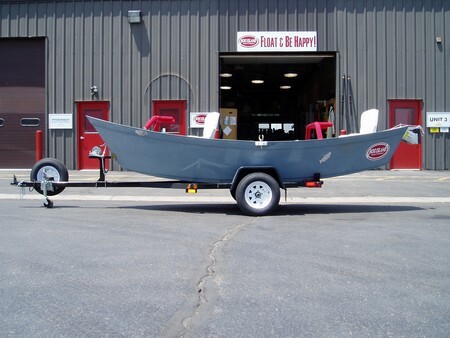 Hog Island Boat Works manufactures the World's only roto-molded drift boat. We do mold a drift boat hull from time to time that has an imperfection, and we will sell these as factory seconds. We currently have two such hulls. We will offer these as river ready packages complete with LTD. 16 foot rotomolded high density polyethylene Drift Boat Hull, LTD. Custom Drift Boat Trailer with 2000 lb. torsion axle, tongue jack and spare tire, Complete Custom Anchor System, Front and Rear Seat Systems, Rowers Seat Slide and Seat, Two Rowers Bench Hatches, Custom Molded Fly Deck with gear bag, Oar Blocks, Oar Locks, Motor Mount, Double Barrel Poly Rod Storage, Front and Rear Custom Padded Casting Braces.